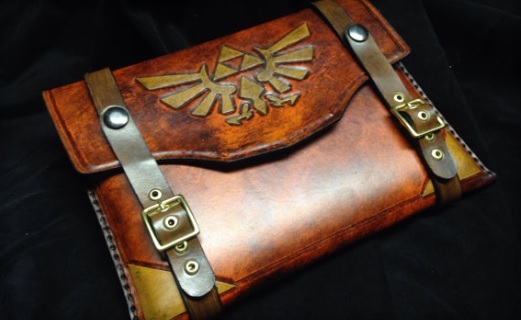 Now your iPad can be safe wherever you go when it is cased up tight with this Legend of Zelda leather iPad case. This Triforce-emblazoned leather case from Etsy seller SkinsNhydez is perfect for carrying your iPad, tablet or favorite book. It’s carefully handmade and adorned with buckles giving it a worn, antique appearance. Open the flap that secures with snaps and you’ll find Link’s sword and shield paired with the famous phrase: “It’s dangerous to go alone! Take this!”. You can order this awesome iPad leather case here: http://www.zeldauniverse.net/2015/03/27/your-ipad-is-safe-with-this-leather-case-from-etsy/. What do you guys thik of this awesome case? Would you use it or keep it hidden from jealous friends? Let us know in the comments.